Thor? A woman?! Really, Marvel? I guess DC doesn’t have a monopoly on screwing up characters. Just a few short weeks after Marvel announced that a new man would wield the red, white and blue shield of Captain America and that the seemingly immortal Wolverine would indeed die, came an announcement that there would also be a new Thor — but that Thor would be a woman. “This new Thor isn’t a temporary female substitute – she’s now the one and only Thor, and she is worthy!” Marvel editor Wil Moss said in the release. DC earned the ire of many fans in 2011 when it completely jettisoned its entire 75 year history and continuity in favor of “The New 52” — a slate of 52 monthly titles, that by now have, for the most part, been replaced by other “New 52” titles. The unapologetic DC has moved toward a catering to the lowest common denominator and moved away from a unified history driven by intelligent stories and strong continuity over the years. What does the future hold for Marvel’s new direction? Time will tell. The KKK is recruiting in Atlanta!? What year is it again!? The Ku Klux Klan is at it again — trying to recruit new members to its cause. As if that was bad enough, the even crazier thing is that a group tied to them spent this past weekend in the middle of the city of Atlanta, practically in the shadow of Sweet Auburn and the MLK Memorial, posting fliers on telephone poles and walls. The fliers, which feature the legend “Loyal White Knights Neighborhood Watch” and a graphic showing a hooded klansman pointing in an Uncle Sam-like pose with the caption “The KKK Wants You,” were posted to walls and telephone poles in the Cabbagetown area. The signs were ripped down shortly after they were posted. The signs were very similar to ones posted in several Alabama towns last month. They’ve been recruiting across other parts of the nation quite a bit lately. I know that a lot of conservatives are not happy with President Obama. Neither am I, but this is going completely off the deep end of the gene pool. Then again, maybe it’s best the Klan-types are doing this — so we know which idiots ought to be deported and sent over to Al Qaeda land. Deport ’em anywhere. Just get ’em out of this country and away from civilized folk. During a rainy game last week, the Chicago White Sox tried to do the right thing by fans at US Cellular Field (I still want to call it Comiskey Park, no matter what!) 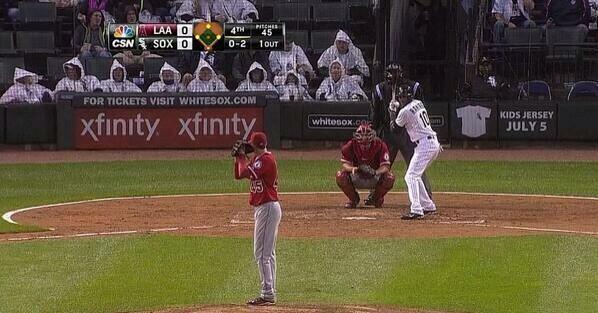 and gave away white rain ponchos. Rain, ponchos, sounds good, right? It didn’t come out that way. Television images of fans at the game with the ponchos on, looked for all the world like a modern-day Ku Klux Klan rally.